Work permit, student visa, non-lucrative… these are some of the most common procedures used in order to start living in Spain legally. But, usually, they imply a lot of hassle: paperwork, requirements and more requirements… This is why, the Golden Visa, especially during the last few years, has gained such popularity. Its main advantage? Simplicity. You invest in Spain and instantly get your residency permit. That simple. So, if we haven’t yet convinced you… in today’s post, we are going to talk about everything you need to know regarding the investor’s visa in Spain for this 2019. Let’s go! ESTABLISHING THE BASES: WHAT IS THE GOLDEN VISA? The Golden Visa program is a special type of residence created especially for all the citizens from outside the European Union who want to move to the Spanish territory. Most residency permits for non-Europeans have complicated procedures. Lots of paperwork, bureaucracy, requirements… too much effort to just get a visa. So much so, the visa for investors in Europe has been gaining popularity that does not stop growing. Why? For the simple promise it makes: speed and simplicity. As pointed out in the newspaper El País, Spain is consolidated as one of the paradises of the Golden Visa. If we look at the data, it never ceases to amaze us: out of approximately 6000 residence permits granted in the country during 2018, about 600 were golden visas. However, Portugal’s Golden Visa could face the Spanish one for the European leadership. The new changes introduced in the Portuguese immigration law make it much easier for investors around the world to get their residence permit in Portuguese lands. What should be clear to us is that the number of golden visas granted in Spain does not stop growing. And, without any doubt, it is a trend that will continue over time. WHO CAN BENEFIT FROM THE VISA GOLD? As we have mentioned, and as we will deepen further in just a second, the golden visa is designed for all citizens from outside the European Union who intend to make an investment in Spain as a means to obtain their residency. The countries in which this residency permit has gained the most popularity are China and Russia, without any doubt. However, people from Iran, Venezuela and Lebanon register notorious activity with this visa too. Their main motivation? They have also found in investing in Spain a place to deposit their money; thus earning the ticket to a visa that largely avoids most of the procedures of the other permits. 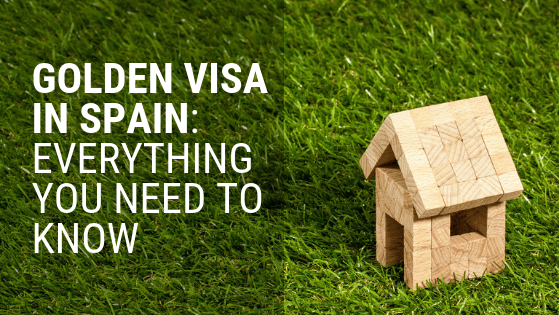 WHAT ARE THE ADVANTAGES OF THE GOLDEN VISA IN SPAIN? It allows you to work and live legally in Spain. With this, we can identify the golden residency as a means to a work permit. In order to obtain this visa, to be considered a resident in the Spanish territory is not required. Remember that this is equivalent to living in the country for more than 183 days per year. The golden visa only demands that the applicant travels to the country once a year. It provides complete freedom of movement throughout the Schengen area; that is, most of the countries inside the European Union. The main applicant (investor), can request at the same time as her residency permit the one of their spouse and children. That is why the investor visa is a totally recommended option for those families who want to start living in Spain. To apply for the golden visa, it is not necessary for the applicant to do it physically in Spain. You can simply designate a representative to collect the relevant documentation for him or her. HOW LONG CAN YOU LIVE IN SPAIN WITH THIS RESIDENCY PERMIT? Once the investor has obtained his golden visa residency, he will have 1 year to reside legally in the Spanish territory. Once this time period has finished, the applicant can request a residence authorization that will allow him to live in Spain for 2 years, period after which he can renew again. In order to carry out this procedure, the expat must demonstrate that she still has ownership of the asset that was the centre of investment; being the property, shares or the public debt. In addition, you must have visited Spain at least once during the year. Are you willing to apply for the citizenship by investment? Remember that the golden visa is one of the many ways to obtain the Spanish nationality. After 10 years of residing legally in Spain, the investor will be eligible for the citizenship. HOW CAN I GET THE INVESTOR VISA IN SPAIN? First of all, you can get your investor visa by purchasing a property (real estate) worth more than € 500,000. But, what happens if the property has been purchased by several individuals/investors? In that case, we must bear in mind that the investment will be computed at the individual level. This means that if our personal contribution to the property does not reach € 500,000, we will not be able to apply for the visa. Secondly, buying shares of a Spanish company, or having a bank deposit in a Spanish entity for a value greater than one million euros. That will also give you access to this residence permit. Possession of Spanish public debt worth 2 or more million euros. Finally, by investing in a business project that will be developed in the Spanish territory. Here, you will find the following main requirements: that project must generate employment, imply an impulse to the scientific/technological advance of the country, or translate into a minimum socioeconomic impact. WHICH ARE THE REQUIREMENTS TO OBTAIN THE INVESTOR’S VISA? Not be a citizen of a country member of the European Union. As we have said, this special residency permit is designed for citizens from countries outside this area, which have it more difficult to get a visa in Spain. Be of legal age (+18 in Spain). Lack of criminal records, both in Spain and in any other country. The deadline to take into account here will be the last 5 years. Having full-coverage healthcare in Spain. This can be obtained through public insurance or a private one. Having and demonstrating the possession of sufficient economic means for the maintenance of both the principal investor and his family (if he also applied for their residency permits). Realize the investment in Spanish real estate (either € 500,000, € 1M or € 2M depending on the route chosen), and provide the corresponding document that proves it. WHAT ARE THE NECESSARY DOCUMENTS NEEDED TO OBTAIN THE VISA GOLD? In the last section, we have seen how one of the fundamental requirements to obtain the residency through real estate investment is to demonstrate, through the corresponding document, that the investment has been made. If we want to obtain the golden visa through the investment in real estate, we must provide as proof of the purchase of the property the certification of domains and charges from the Property Registry. In the case of investing in Spanish shares or participations: a statement of the investment from the Investment Register of the Ministry of Economy in the case of participations; and a certificate of the financial intermediary registered in the Securities Market National Commission for the purchase of shares. If what we have done is to invest in Spanish public debt, we will need the certificate from the Bank of Spain or from the financial institution with which we have managed the investment. In that paper, we need to clearly identify how we are the protagonists of that purchase. Finally, for investments in bank deposits, we will need the certificate issued by the financial institution with which we have contracted the deal. Important is the fact that in that paper we indicate that we are the sole owners of the deposit. Once we know exactly what requirements we must meet in order to obtain this visa and what documentation we need to provide, we have to resolve the doubt about the time frame. How long does it take to get the golden visa? When delivering all documentation to the competent authority, it may take 20 days before we receive the resolution. It can be favourable or we can get a denial. After having received the resolution with a favourable result, we have a period of 1 month to apply for our visa in the Spanish consulate located in the country of the investor. It will be at that time that we must travel to Spain because we must submit the application for the Golden Visa with the received approval. The next step will be to obtain the TIE (Identity Card of the Foreigner), as well as taking the fingerprints in any police station in Spain. We can not wait too much in this process, we only have 1 month to do it. If you do not feel like dedicating the time it takes to perform all these boring procedures … let us do it for you! Contact us and get your Golden Visa FAST. We will guide you from start to finish, you will just need to sign! ARE YOU GOING TO LOSE THE OPPORTUNITY TO OBTAIN THE SPANISH RESIDENCY BY JUST INVESTING IN THE COUNTRY? And, up to this point, the answer to most of the doubts and frequently asked questions regarding the golden Spanish visa. If something has not been clear to you or if you have any specific questions on your particular case… do not hesitate to contact us, we will be happy to help you out! My name is Ali Ismail. Im having a business in DUBAI and I would like to apply for a golden visa, can you please let me know more information about process and your company fees/time frame. I am married with no kids, my wife is Romanian and im holding Lebanese passport. Sure, we will contact you via email providing further details.